Considering the global appetite for crime and thriller novels - the most bought and most borrowed form of fiction - and the immense worldwide popularity, across all cultures, of sports and games, it's rather surprising how rare it is to see a thriller set in the world of professional sports. Given all the scandals in recent years, from Lance Armstrong to FIFA, the impact of big money, and the way sports can bring out the very best and the very worst in people, fictional tales of danger and dirty deeds in elite sport wouldn't require much suspension of disbelief. In fact, the world of sport would seem incredibly fertile ground for a well-told tale. That proves the case with THE FIXER, a rollicking story which takes us deep inside the locker rooms and politicking of top-level French club rugby. Mark Stevens has played at the highest level of world rugby, as a test first five for the All Blacks (New Zealand's champion rugby team), and is now looking to secure his financial future as his playing career wanes by playing pivot for a French club in the less-elite but more lucrative European leagues. When a beautiful Brazilian journalist sashays into his life, it comes to pass that there is more than publicity and a fling on offer. When a seemingly innocent comment about his team's chances in an upcoming game results in an expensive gift from 'a friend' of the journalist, Stevens realises he's unintentionally stepped onto an ethical tightrope. Battling his own injuries and form and looking to cash in while he still has a chance, Stevens finds himself at a crossroads, not just in his rugby career, but who he is and wants to be as a man. Debuting novelist Daniell, a former rugby pro who's won a prestigious British sports book award for a non-fiction expose of French club rugby, takes us deep inside the world of professional rugby in this intriguing tale. We get a multi-layered insight into what is a fascinating setting. While "the game the play in heaven" (as rugby union is nicknamed) was born in the private schools of England, and elevated by the working class on the fields of New Zealand and South Africa, increasingly it is French club rugby where the game's biggest money is pouring. Young stars on the rise as well as global superstars at the tail end of their career are cashing in and heading to France from all points on the global rugby compass. That is on show in THE FIXER, where Stevens' team-mates are a veritable United Nations cast of characters. And it is in that characterisation where Daniell particular excels. While Stevens and his team-mates can at times seem a bit laddish, there is also a level of insight into the complexities of modern-day masculinity. Daniell has spun a page-turner that is full of banter and bloke-ishness, while also being a thoughtful meditation on various aspects of life. For readers in Daniell's native New Zealand, THE FIXER has echoes of bushman novelist Barry Crump, who had no compunction in extolling the virtues of 'the good keen man', or the pleasures of a rugged life connected to the land. Stevens plays a hard physical game where careers are short. The pressures of top-level sport and their effects are laid bare for readers to see, from dodgy painkilling practices to the lies players and management tell each other. Daniell lifts the curtain on an intriguing setting, while delivering a novel packed with wit, humour, and a fun cast of characters who could be leading figures in other tales themselves. 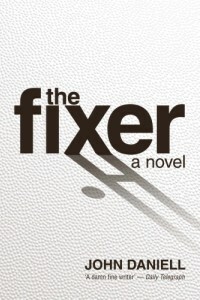 It's not something I usually comment on in reviews, but I think THE FIXER is the kind of book that could be enjoyed by a broader-than-usual readership, from crime/thriller fans to sports fans and other readers, and even those out there (men in particular) who aren't usually keen on reading fiction. With the Rugby World Cup kicking off in England next month, it would be an ideal read for any rugby fan out there. Or anyone just interested in a cracking good story set in a world we don't usually get to see on the page.